Home » United Airlines » United Really Doesn’t Want You to Steal Onboard Bedding! United Really Doesn’t Want You to Steal Onboard Bedding! Theft of Saks Fifth Avenue bedding continues to be a problem on United Airlines. So much so that United has redesigned its business class menus to warn against theft. Nicely, of course. 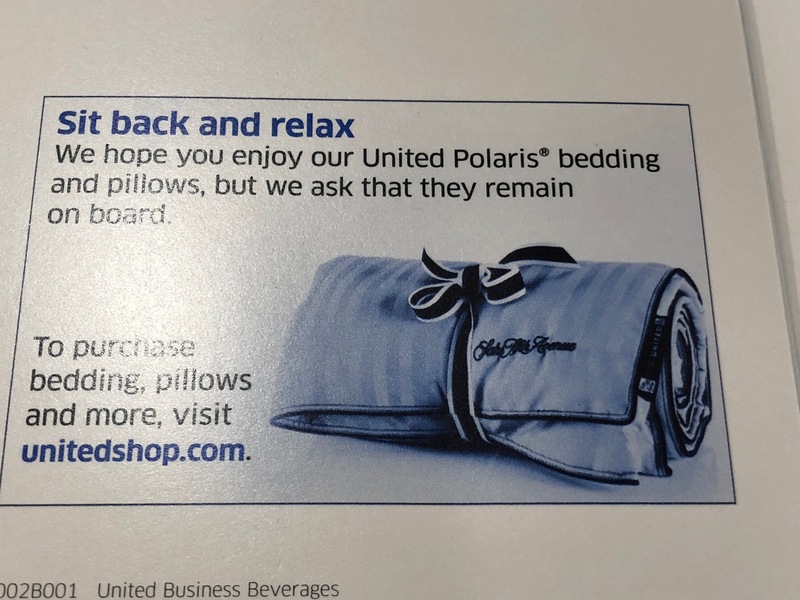 Like warning labels on tobacco products, onboard Polaris business class menus now prominently display not just one, but two boxes asking customers not to remove the bedding. > Read More: United Warns FAs: Stop Customers from Stealing! This has been a problem since the inception of Polaris in December 2016. Our customers are continuing to enjoy United Polaris service, in particular our new high-quality bedding designed by Saks Fifth Avenue. However, recently we’ve noticed some confusion about which amenities may be taken off the plane at the end of the flight. We’d like to take this opportunity to clarify the policy regarding our new bedding and ask for your help to ensure its safekeeping on board the aircraft. I do think it is sad United felt forced to put these prominent warnings on its menus, but I’ve seen passengers steal the bedding. When too many people do it, everyone loses. If you love the bedding on United, you can buy it. See the link below. Please don’t steal it. What I don’t get is how people make off with the bedding??! I mean, it’s not as if it’s a drinks coaster that you can simply drop into your bag and go. Wouldn’t the FAs be able to spot would-be thieves in the act from a mile away? There was a guy at FTU who showed me his suitcase FULL of Polaris bedding. Disgusting. Six pillows / six blankets! Kleptomaniac! It seems ridiculous, but some people do question or think the bedding can be taken with them. I follow a lot of travel bloggers on Instagram and whenever they post pictures of business or first seats with the pillows and blankets prominently shown, there are always people who genuinely ask if they can take it with them after the flight. Maybe because they assume since the seat is so expensive it’s a perk, or they can’t imagine reusing bedding? I don’t know. But I’ve seen the question too many times now to dismiss it. So though it seems obvious to the seasoned traveler, the “once in a lifetime splurging traveler” just might need the guidance. imagine being so rich you can fly business class but not rich enough to buy bedding items and steal those that were used by someone else 24 hours ago. Good god. Why can’t United be smart enough to offer an incentive?! 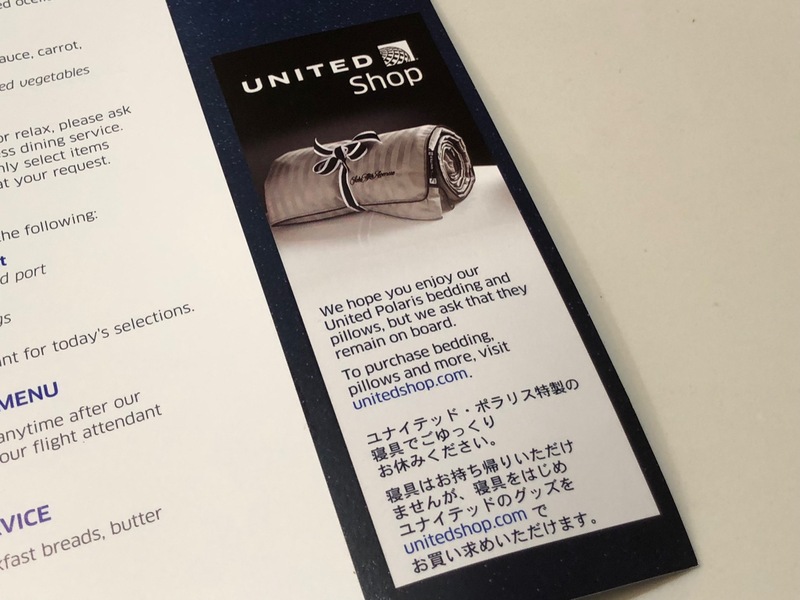 I agree that the menus look tacky with the “do not steal” language, but I also think UA would be better served to offer a discount as suggested above at the United Shop. Of course, rather than stealing, I did purchase a Polaris blanket from the shop, but a discount code would have been nice. It’s win/win for UA, increased sales on a popular product and marketing of the brand in the customer’s home. I guess there just isn’t a market for premium cabin service items, but when AA was rebranding after the merger with US, I tried to ask at the Admiral’s Club if I could buy some of the wine glasses with the old AA logo. I was told they’re not for sale. Why not sell to customers service items that you’re phasing out? Just curious, did you end up taking a few glasses? It seems to me in that case, since they will be retired and presumably gotten rid of anyway, a souvenir is less of an issue. Back when United was phasing out its Westin Heavenly bedding, a FA actually encouraged me to take one as a souvenir. Seems quite different than the Polaris blanket situation.